Google Loves High-quality social signals from various high PR sites.Thousands of users access high-authority Bookmarking sites daily.Social Bookmarking is one of the best method to build back-links to your Website/Blog.I will manually submit/bookmark your Website/Blog links to the top social bookmarking sites.I hope your website or blog ranking will be increasing day by day.Besides you will get enough traffics and popularity from the top social bookmarking sites .So please sir,give your order and enjoy the service. 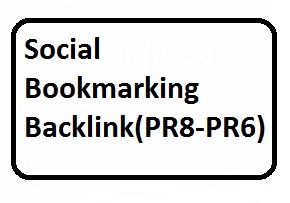 Boost Ranking-15 PR8 to PR6 Social Bookmarking Backlink For Website is ranked 5 out of 5. Based on 110 user reviews.